The 2018 Porsche Tennis Grand Prix tennis tournament for women players on the WTA circuit is taking place this week from April 22-29, 2018, on the indoor clay courts at the Porsche Arena located in Stuttgart, Germany. Here is a list of the prize money up for grabs for the women tennis players at the 2018 Porsche Tennis Grand Prix. 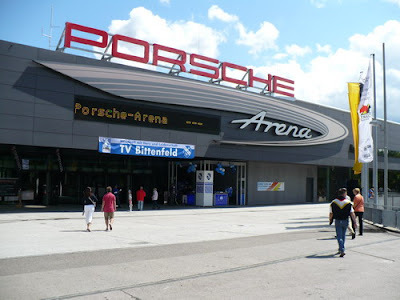 The 2018 Porsche Tennis Grand Prix, also known as the Stuttgart Open, is a Premier event on the WTA circuit which means it has a prize money fund between $600,000 and $1 million. Actual prize money at the 2018 Porsche Tennis Grand Prix is $816,000. All prize money below is in American dollars converted from Euros. The prize money is not cumulative, players only earn the amounts shown for the last round they advance to. In a cool perk, the winner of the 2018 Porsche Tennis Grand Prix also gets a brand new Porsche 911 Carrera GTS Cabriolet sports car valued at over $130,000. The highest ranked women playing in the 2018 Porsche Tennis Grand Prix are Simona Halep, Garbine Muguruza, Elina Svitolina and Jelena Ostapenko. Maria Sharapova, who has won this event 3 times, is also playing.